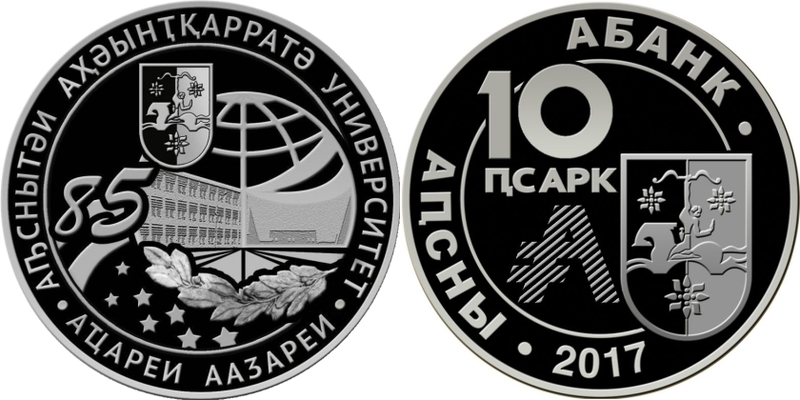 On September 26th, 2017 the Bank of Abkhazia issues into circulation silver and gold plated commemorative coins "The 85th anniversary of the Abkhazian State University" of 10 apsars denomination. The rim is raised on both sides of the coin. The edge of the coins is corrugated. The quality of coins is proof-like. Mintage: 700 pcs of silver coins and 500 pcs of gold plated coin.. In the upper left part on the mirror field, the denomination of the coin “10 ҧсарк” is written in the Abkhazian language. The right lower part bears the relief image of the state emblem of the Republic of Abkhazia. In the semicircle, there is an inscription in the Abkhazian language “Аҧсны Абанк”, and in the lower part the year of issue 2017 is indicated. On the reverse side along the circumference, there is the name of the University in the Abkhazian language “Аҧснытәи Аҳәынҭқарратә Университет” and the motto “Аҵареи Ааӡареи” (“Education and Upbringing”). The central part depicts the globe, which is a symbol of the Abkhazia State University’s entry into the Eurasian Association of Universities. Against the background of the globe, the University building is depicted. Beneath it is a laurel branch as a symbol of peace, and below it – seven stars, attributes of the national flag. The central left half bears an inscription – 85 years, which indicates the number of years since the foundation of the University. In the upper part, there is an image of the state emblem. In the upper left part on the mirror field, the denomination of the coin “10 ҧсарк” is written in the Abkhazian language. The right lower part bears the relief image of the state emblem of the Republic of Abkhazia. In the semicircle, there is an inscription in the Abkhazian language “Аҧсны Абанк”, and in the lower part the year of issue 2017 is indicated. The state emblem and the number “10” are depicted using a gilding technique. On the reverse side along the circumference, there is the name of the University in the Abkhazian language “Аҧснытәи Аҳәынҭқарратә Университет” and the motto “Аҵареи Ааӡареи” (“Education and Upbringing”). The central part depicts the globe, which is a symbol of the Abkhazia State University’s entry into the Eurasian Association of Universities. Against the background of the globe, the University building is depicted. Beneath it is a laurel branch as a symbol of peace, and below it – seven stars, attributes of the national flag. The central left half bears an inscription – 85 years, which indicates the number of years since the foundation of the University. In the upper part, there is an image of the state emblem. The state emblem, the globe and the laurel wreath are depicted using a gilding technique.